The sunrise and sunset times come from (Cottom’s Edition) Richardson’s Almanac, 1861…Calculated by David Richardson, of Louisa County, VA (Richmond: J. W. Randolph, ). For more precise sunrise/sunset and moonrise/moonset information, visit the the U. S. Naval Observatory site. But…. according to the Observatory, the data you sited is off by five minutes. 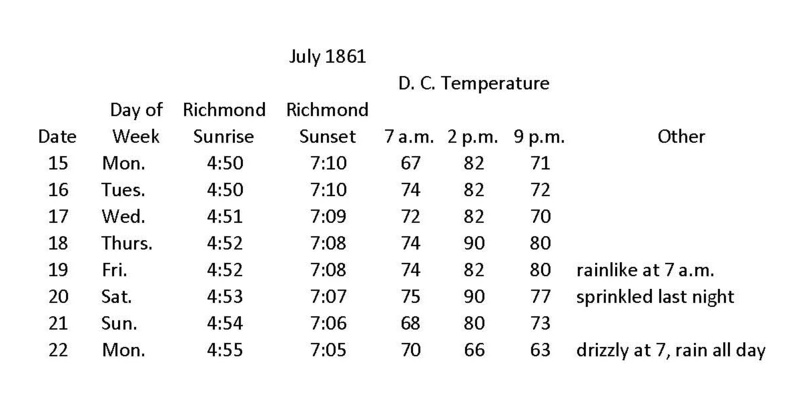 The source for the Richmond sunrise/sunset times is (Cottom’s Edition) Richardson’s Almanac, 1861…Calculated by David Richardson, of Louisa County, VA (Richmond: J. W. Randolph, ). So it seems these were predicted times.